Next up in the series on Luther's Smokehouse is this Pemmican Style Beef Jerky. Read my reviews of their other jerky varieties. This Pemmican Style is meant to mimic what Native Americans made centuries ago by grinding up meat and mixing it with spices and fruit. In this case, Luther's Smokehouse uses raisins. A year ago I wrote a review of 4D Acres Emu Jerky, which was also a "pemmican style" made by Luther's Smokehouse and also included raisins. Beef, raisins, salt, spices, garlic powder. The first thing I taste from the surface of these pieces is a light sweetness. I can sense a faint fruity flavor too. The chewing flavor starts with a noticeable saltiness, and the raisins seems to have a greater flavor, though not well defined as raisins. My initial impression is that this jerky is quite bland, and completely opposite of what I found with Luther's Smokehouse's Old Fashioned beef jerky. The Old Fashioned line of jerky was brimming with a smoky natural meat flavor and plenty of seasonings. 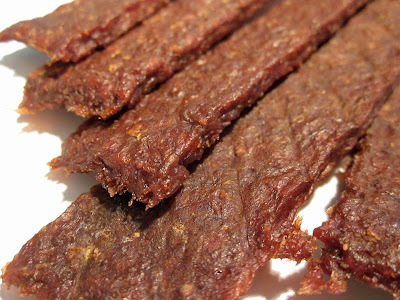 This Pemmican Style has little flavor, mostly that raisin flavor and not much else. The raisin flavor doesn't taste exactly like raisins, it doesn't have the tangy, sweet, fruity flavor that you get from eating raisins, it just adds touches of those characteristics without really coming out front and defining itself as raisins. As for what flavor dominates this jerky? Well, it's those raisin characteristics I listed above. I don't really taste much natural meat flavor, perhaps none at all. The level of saltiness in this feels light. The spices are not really noticeable. This is a chopped & formed jerky shaped into thick strips of about 5 inches long. It's a dry jerky with a dry surface feel. The strips have a little flexibility but will break apart with some bending. It has a chewy consistency like you'd expect to find in a chopped & formed jerky, but I think more soft than usual. Imagine taking a corn tortilla and rolling it up small and then taking a bite. The chewing texture starts out stiff and chewy, but quickly breaks apart with just a little chewing resistance. Then it breaks down into a soft mass quite quickly, and at that point it feels crumbly, but still meaty, similar to like eating dry meat loaf. I didn't encounter any hard bits or crunchy bits of material that I often find in cheaper grades of chopped & formed jerky. It seems very meaty. It's also very clean eating. My fingers are totally dry and not sticky or oily in any amount. Luther's Smokehouse sells this Pemmican Style Beef Jerky from their website at a price of $6.50 for an 8oz package. If you bought two packages shipped to Southern California, the shipping cost is $8.95, which creates a total of $21.95. That works out to a price of $1.37 per ounce. 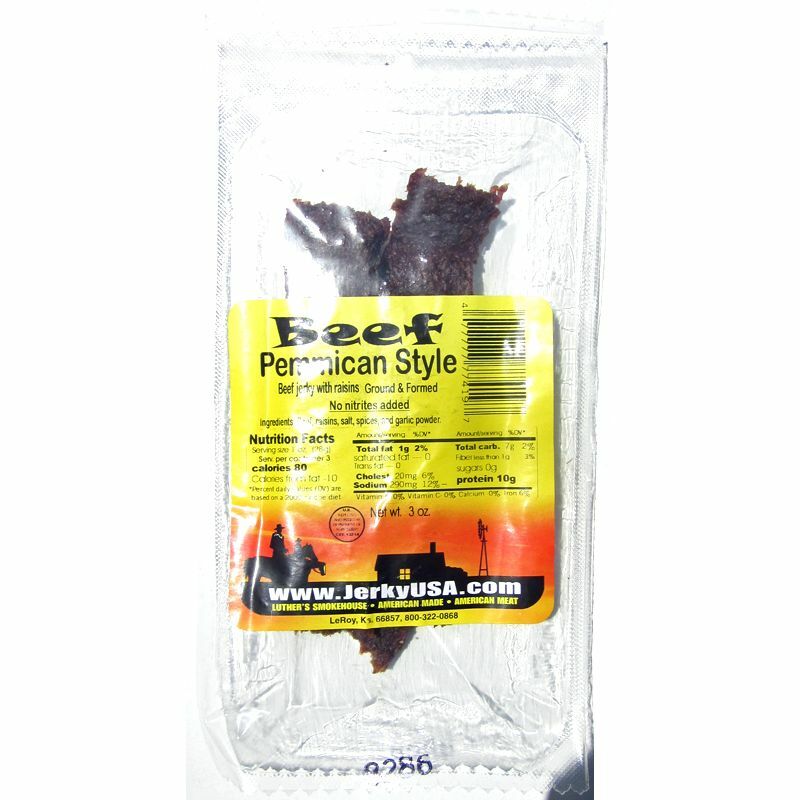 For general jerky snacking purposes, at the $1.37 per ounce price, this jerky presents a fair value. I'm not getting much snackability due to a bland, uninteresting flavor. And even though that price is considerably lower than whole muscle jerky brands you get at the grocery store, the low level of snackability seems to justify the lower price. 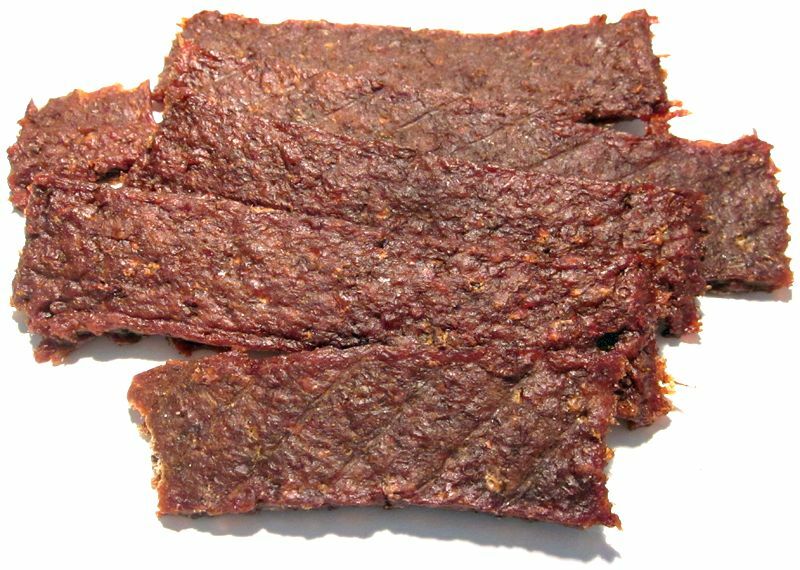 This Pemmican Style Beef Jerky doesn't seem to provide much flavor aside from some faint raisin characteristics like some tanginess, some fruitiness, and some sweet. But it doesn't taste like raisins, only has that influence. If you read my review of 4D Acres Emu Jerky, which was also made by Luther's Smokehouse and is also chopped & formed, I gave their emu jerky a 1-star rating, saying that the raisins just doesn't seem match well with the emu meat. I found something a little different with this beef jerky. The absence of any natural meat flavor in this actually makes it more tolerable with the raisins. And I also think the use of beef give this a bit more of a meaty chew than the emu meat. But overall, it's still crumbly chewing. My recommend beer pairing for this, go with the Lost Abbey Judgement Day, a belgian ale fermented with raisins.